Dessert “Best In Show” winner at the 2017 Vaper Expo UK! Warm, velvety layers of rich vanilla cake, sweet buttercream and fresh blueberries, drizzled in a sweet sugar glaze. Have your cake and vape it too! More great things from Glas Vapor’s new Basix line. 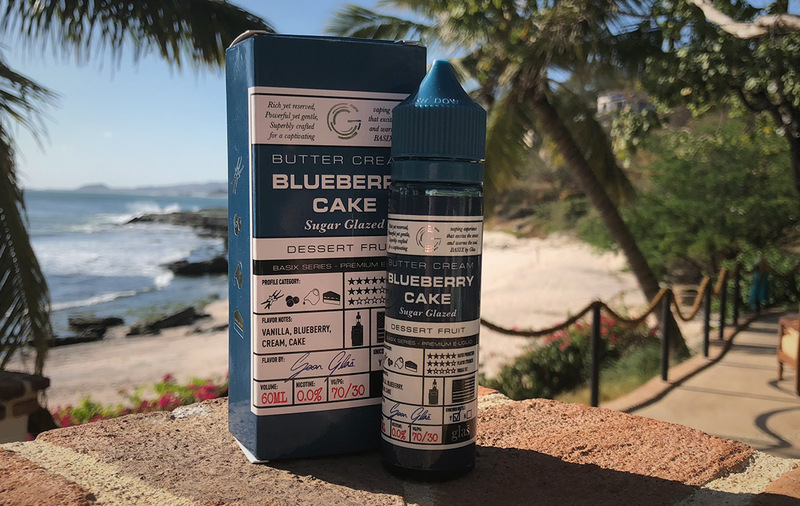 Blueberry Cake might be one of the tastiest Blueberry profiles we have tried. It’s not a super unique vape, Cake, Glazed Sugar, Vanilla, and Blueberry. But it’s the authentic quality of the Blueberry that makes this one stand out. There is a really nice balance between the Cake Pastry and the Blueberry with a nice tone on the Glazed Sugar, basically the balance is spot on. This is really a profile for the Blueberry lover, it’s intense. And hey it won “Dessert Best in Show” at Vape Expo UK 2017. Check it out, this line seems to be pretty great value and the packaging keeps speaking to us (pretty dope). Exhale: A Glazed BLueberry Donut like vape.